Fremont Street is famous for its old-school Vegas charm. The Fremont East Entertainment District, which is just east of the street's covered pedestrian mall, combines this vintage allure with a modern touch. 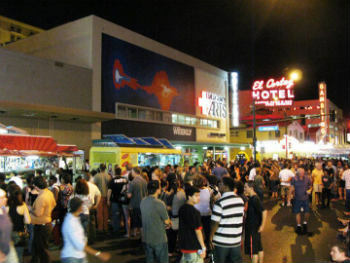 While seamlessly integrated with the stretch of casinos and attractions in the Fremont Street Experience, Fremont East is its own unique district aimed at locals and tourists alike. Here, visitors will find the biggest nightlife scene in Downtown Las Vegas. The crowd tends to be a little younger (20s - 30s) and hipper, but there’s a diverse range of establishments, each with a different appeal. These range from piano bars with singing patrons to artsy cafes with poetry jams. Few areas of Las Vegas have seen as much recent revitalization as the Fremont East Entertainment District. The redevelopment began in 2002, when the City of Las Vegas created the district. The vision was to establish a pedestrian-friendly community with diverse street life and attractions. 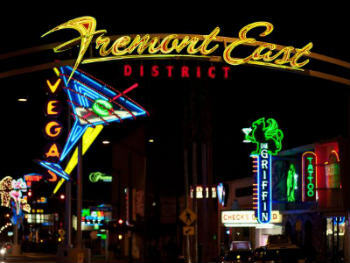 The fortunes of Fremont East improved in 2007, when a $5.5 million public-private investment fund was secured. This led to a series of new openings that continues to this day. Within its six-blocks, there are 14 bars/lounges, 21 restaurants/small eateries, an outdoor shopping attraction, casino and various retail. The boundaries run from Las Vegas Boulevard east to 8th Street and from Ogden Street south to Carson Avenue. Pedestrians walking east from the Golden Nugget and surrounding casinos will notice a change in vibe as they continue along Fremont. Just past where the Viva Vision light canopy ends is where Fremont East begins. It's marked by a distinctive neon sign just across Las Vegas Boulevard. Beyond this sign are an array of other neon structures, including a giant ruby slipper and martini glass. On any given night, the neons light up a crowd made up of young professionals, hipsters, tourists and average Joes. The bars and other establishments are close together — making the area ideal for bar hopping. These owner-operated businesses exude local charm and Vegas culture. Food and drink prices are more affordable. Some lounges are upscale, but you’ll never have to worry about adhering to Strip-like dress codes. While Fremont East is open to drivers, it is still ruled by pedestrians. In fact, drivers will do better to avoid Fremont Street and opt for side streets instead. On weekends the party spills out on to the sidewalks as patrons check out the seemingly never-ending cycle of new-bar openings. Like the Strip, you can bring alcohol outside; however, city ordinances prohibit glass containers. Police frequently patrol the area and strictly enforce this rule. Anchoring Fremont East is the district’s one casino — the El Cortez. A member of the National Register of Historic Places, El Cortez has retained the same exterior since opening in 1941. This 364-room ranch-style casino is not afraid to flaunt its vintage status. 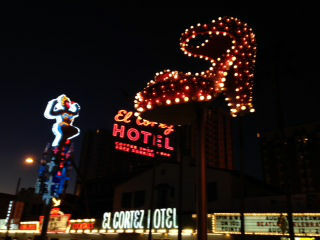 Somehow, the El Cortez fits in perfectly among the modernized old buildings and diverse crowd on Fremont. The hotel also features two parking decks, which are generally $5 or free with an El Cortez player's card. While many Fremont East joints open during the day, the scene really gets going at night. There seems to always be new bars and lounges being added, but some establishments have become mainstays in the district. This includes the Griffin, with its distinctive green neon sign. The inside is dark and cozy but certainly not dingy. The fireplaces keep things subtly lit as bartenders pour craft beers. As one of the original bars that sprung up with Fremont’s revitalization, the Griffin has a reliable following among the downtown crowd. Just around the corner is the deceptively hidden Downtown Cocktail Lounge, which manages to be even darker inside. This ultra-hip joint features modern dance music in a sophisticated setting. Across the street at the north corner of Vegas Boulevard and Fremont, you’ll find the rural-themed beer garden Park on Fremont. With its white picket fence, antique tables and potted flowers, this gastropub definitely does not feel like Vegas. The outdoor patio is a great spot to enjoy unique grub like fried chicken and waffle sandwiches while people-watching. The back of Park is styled like a garden and even features a seesaw within a hidden nook. Next door at Radio City Pizzeria, guests can get more straightforward Italian fare and cheap pitchers of beer. Just a few steps down the street is an entirely different type of lounge at Insert Coin(s). This establishment takes the idea of an arcade and combines it with a dance club. Patrons can play Donkey Kong, Mortal Combat and Space Invaders between enjoying local DJs on the dance floor. If video games and bottle service aren’t your speed, then step into the sophisticated Vanguard Lounge right next door. This quaint cocktail bar is the perfect place to try unique handcrafted drinks you won’t find anywhere else. The south side of Fremont East is where to find the best live music venues. Since 2005, the Beauty Bar has hosted local and up-and-coming national bands at its inside or outside stage. Its beauty salon decor is juxtaposed with punk and indie music. For those who want to be directly involved with the music, stop in next door at Don’t Tell Mamma. This piano bar is decidedly different than the ones located on the Strip. The entertainers take requests and allow patrons to take control of the microphone and sing. More live music and regular stand-up comedy is available nightly at Backstage Bar & Billiards less than a block away. This spacious venue is decorated with old records and features several full-sized pool tables. Fremont Street isn’t just about drinking. The district is home to several eateries perfect for dinner or just a snack between bars. Including the aforementioned Park and Radio City Pizzeria, Fremont East features 12 sit-down restaurants. Sandwiched between Don’t Tell Mamma and the speakeasy-esque Commonwealth lounge is Le Thai. Half of Le Thai’s decidedly cramped interior is actually outdoors (with no air conditioning), but the decor feels like a chic wooden shack that somehow fits in perfectly with the neighboring bars. The menu is also small, but the options are so rich and filling, you won’t mind. For modern Mexican food, stop in La Comida at the corner of Fremont and 6th Street. This artsy cantina is known for its specialty margaritas and tacos. When late-night hunger sets in, the best neighborhood option is the 24-hour Cafe Cortez at El Cortez. The menu may be limited, but the selection of breakfast, lunch and dinner standards is sure to hit the spot. Scattered among the bars and restaurants are a handful of stores, including a clothing boutique and tattoo parlor. For more shopping options, you’ll have to head over to Downtown Container Park at the corner of Fremont and 7th Street. This unique 19,000-square-foot retail complex was built from shipping containers and features 25 shops and three restaurants. Not only is Container Park family friendly (there’s an interactive playground and 40-foot tree house), it’s great for browsing owner-operated boutiques and art galleries. Free concerts are held most nights at its outdoor stage. Fremont East is also home to a burgeoning art scene outside of Container Park. 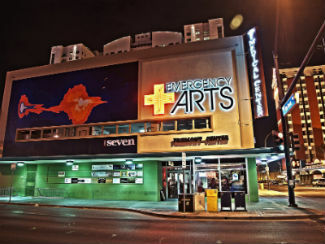 Emergency Arts, which is located in the old Fremont Medical Building, is a creative collective touted as “the first of its kind in Las Vegas.” The Emergency Arts building is designed to be a place for working artists and non-profits to synergize, but curious passers-by are free to wander in and check out the common space gallery. On ground level, one will find the Beat Coffeehouse, which also serves unique food items, wine and sells used records. Check back often for open mic night, when poets, comedians and musicians try out new material. 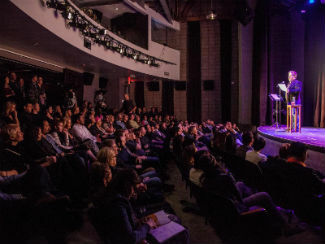 The minds and entrepreneurs behind Emergency Arts also opened Inspire Theater in 2014. This 200-seat venue was created out of a neglected old building at the south corner of Fremont Street and Vegas Boulevard. This three-story structure also features a newsstand and three bars of its own.